Vantage - 16 awg plenum rated 2 conductor Bus Cable 300 volt insulation Vantage label 1000 ft.
Home > Products > Infrastructure (i.e. Enclosures) > 16 awg plenum rated 2 conductor Bus Cable 300 volt insulation Vantage label 1000 ft.
16 AWG PLENUM RATED 2 CONDUCTOR BUS CABLE 300 VOLT INSULATION VANTAGE LABEL 1000 FT.
16 awg plenum rated 2 conductor Bus Cable 300 Volt insulation, Vantage label (Sold in 1000 ft rolls). Vantage plenum rated Station Bus (VPLENUM-CABLE) provides the low-voltage wiring infrastructure from enclosures to stations and keypads. 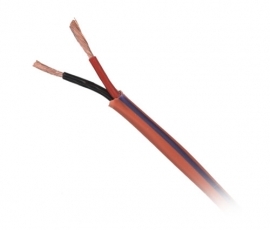 Insulation for plenum rated cable is rated up to 300* volts. InFusion Station Bus carries the picofarad rating to meet the distance and power specifications for Vantage installations.